Ever think that making your own products wasn't worth it?? I especially don't want to waste my hard earned money on ingredients just for the darn recipe to not be any good. And I certainly don't have all this time to make it and it flop!! I will be bring to you easy recipes that do not cost a ton of money to make and almost all are tried and true recipes. I will let you know if I have not tried it yet. Disclaimer: Check with your physician before using any essential oils or recipes that could react with any prescription medications you are taking. Also, some recipes are not to be used by pregnant and lactating women. I will try my best to provide you with a warning on any recipes for these conditions, but not all recipes will have this warning...it is up to you to check for yourself. The first recipe I want to share is so simple...two ingredients in fact!! All you need is virgin coconut oil and your favorite essential oil. Take about 1/2 cup coconut oil and 5 to 6 drops of essential oil, mix and store in your favorite container. This is the best moisturizer I have ever used. Depending on what essential oil you use, it can be applied to acne prone skin. Here are some things to consider when picking your essential oil. Lavender oil- An analgesic (pain reliever), antiseptic, and immune stimulant. It is thought to be good for skin care and to promote healing, especially in burns, bruises, scrapes, acne, rashes and bug bites. Lavender has a calming effect, and is used for insomnia, stress and depression. It has been reported effective as a decongestant through steam inhalation. Lavender oil may have use as an anti-fungal agent, and may be used for Athlete’s foot or other related conditions. Eucalyptus Oil: An antiseptic, antiviral, and decongestant (also an excellent insect repellent), Eucalyptus oil has a “cooling” effect on skin. It also aids with respiratory issues and is thought to boost the immune system. Melaleuca (Tea Tree) Oil: Diluted in a carrier oil such as coconut, Tea Tree oil may be good for athlete’s foot, acne, skin wounds, and even insect bites. A small amount can be added to shampoo to prevent dandruff and head lice. Peppermint Oil: An antiseptic, antibacterial, decongestant. Using in lotions can help sooth dry skin and give a minty fragrance. Geranium Oil: Geranium oil is reported to inhibit the production of sebum in the skin, and may be helpful in controlling acne. When a small amount of oil is diluted in shampoo, it may be considered a treatment for head lice. This oil has a rose like smell and is great for making lotions and perfumes. Frankincense Oil: Direct application of the oil may have antibacterial and anti-fungal properties, and is thought to be helpful for wound healing. Using this oil in facial serums and lotions can potentially reduce wrinkles as well. If you don't know were to buy some great essential oils, you should look at these two places that are my favorite!! As always I enjoy comments, and without them I will fail to grow as a blogger!! what a neat and simple lotion to make! will have to try this out soon! That is simple! Thanks for sharing the idea with others on the Thumping Thursday bloghop. 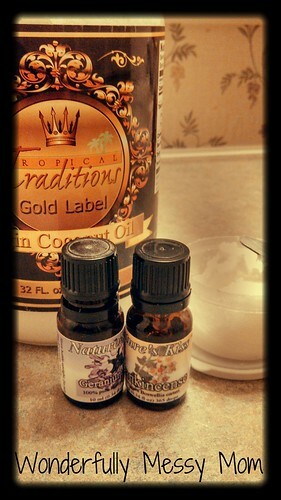 I am so obsessed with coconut oil and essential oils right now!! Is it really that simple?! I will have to try. Thanks for linking it up to Snickerdoodle Sunday!